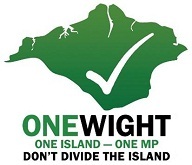 The OneWight campaign was set up in 2010 to campaign against proposals to merge part of the Island with a mainland parliamentary constituency. It was a cross-party campaign led by Andrew Turner MP. The OneWight website is still available online. The Coalition Government set out their intentions in 2010 to reduce the number of MPs and equalise the size of parliamentary constituencies. It soon became clear that these proposed changes could lead to the Isle of Wight being split, with part of the Island facing becoming part of a cross-Solent seat. Ignored the unique nature of the Isle of Wight as a close-knit and cohesive community, recognised since 1832. Failed to recognize that it makes good sense for Islanders to be represented by a Member of Parliament focused on the Island and living here. Would have resulted in some Islanders being represented by one or more MPs whose main focus would be on the mainland, to the detriment of Islanders. Would have made Government more distant and less transparent. Would have deterred people from political involvement. Would have added to the organisation and cost of elections. Ignored the wishes of the Island as there had been no attempt to consult Islanders. In short, the plan was poorly thought out, would damage democracy and was against the interests of the Island and Islanders. The campaign included a parliamentary petition signed by thousands of Islanders being presented to the House of Commons and delivered to Downing Street. In February 2011, the Government announced that the Isle of Wight would be given protected status with two parliamentary constituencies to be contained within the Island's shores, and not having to share an MP with the mainland. This was voted through Parliament on 17 February 2011. The OneWight campaign was therefore considered to have been a success. Following this success, the plans for the reform of constituency boundaries were dropped due to the Liberal Democrats withdrawing their support. Therefore the Isle of Wight will remain as one single parliamentary constituency in the 2015 General Election.